Medical Volunteers International (MVI) is a volunteer organization initiated and created by Chinese physicians in the United States. It is non-profit, non-religious, and non-affiliated to any political group. It is for all Chinese physicians and other physicians of other ethnicities in the world to join, collectively promote, and develop international medical volunteering. 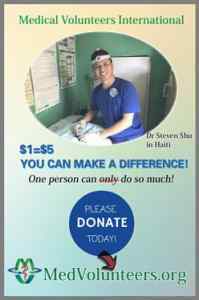 Dr. Shu is the founder of Medical Volunteers International (MVI), and he is currently serving as MVI President. MVI’s aim is to provide Chinese physicians and physicians of other ethnicities with useful information about international medical volunteering, and to build a platform for volunteers exchanging and sharing personal experiences. Through connection and communication with other international medical volunteer organizations, MVI will help their members find suitable volunteer projects. Meanwhile MVI will actively create and initiate its own projects in Haiti, Cambodia and Senegal beginning in 2018. These projects will focus on helping areas in urgent need of medical resources and supplies, as well as patients in need of necessary medical treatments. In 2014, Dr.Steven Shu joined the “No-Scalpel Vasectomy International, Inc”, an international medical volunteer organization led by Dr. Doug Stein. Dr.Shu made a total of five trips to the Philippines and Haiti in the past three years. Dr. Shu’s personal experience led him to a larger vision, driven by a sense of individual responsibility and ideology. He realized that an individual’s strength is often limited. However, if individuals come together to build an organization, this organization’s power will be unlimited. There are more than 6,000 Chinese physicians in the United States, hundreds of thousands around the world, and much more in Mainland China, Taiwan, and Hong Kong. With the power of social media and social networking, overseas Chinese physicians should be able to set up an organization, such as MVI, to connect with people around the world to help those in need of medical aid. Through communicating with other Chinese physicians, Dr.Shu learned that many physicians share similar interests and goals, and are willing to be involved in medical volunteering, but most of them do not know how or where to start. He also learned that some physicians in North America are already at the forefront of such endeavors, Therefore, at the end of 2016, after careful and thorough consideration, Dr.Shu decided that the time for advocating overseas Chinese physicians to establish an international medical volunteer platform has come. MVI was incorporated on February 8, 2017. By April 30, 2017, a total of 130 people joined the MVI with 94 official physician members. IRS approved the MVI’s 501 C3 tax exempt status in the March, 2017.